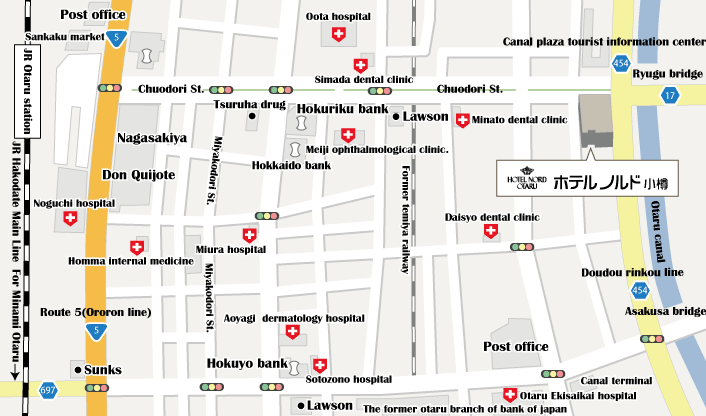 Access Map | stay for the Otaru sightseeing, HOTEL NORD OTARU. It is about 85 minutes (it operates every 30 minutes.) in " Rapid airport　liner" from JR Chitose Line Shin-Chitose Airport Station to JR Otaru Station. By the car, It is about 80 minutes at a highway from Shin-Chitose Airport to Otaru. JR rapid liner use about 35 minutes. The number which can be accommodated 46. In parking lot use, the price is 1,200 yen per one-night set.